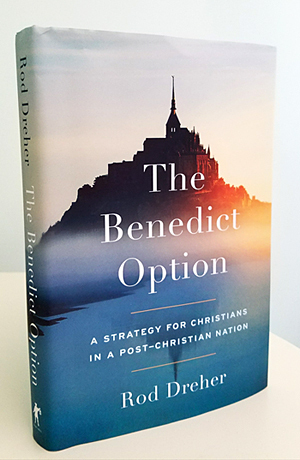 I’m blogging through The Benedict Option by Rod Dreher. In my first post, I set out my reasons and credentials and then considered some of my problems with Dreher’s broad-stroke history of fifth-century Rome. Then I continued the discussion of history, talking about why it matters for a book like this and then moving into monastic history. Today, I look at two more historical issues raised for me in Chapter 1: post-Roman powers, and ‘barbarism’ — both are related. I think the designation of late Roman, irregular military forces that coalesced as nations while they conquered Roman territory as ‘barbarian tribes’ is taking things too far. Theoderic and the Ostrogoths who oust Odoacer are not ‘tribes’. They are a late Roman military force whose leader never received a lasting military command from the Emperor Zeno, and who took control of an unstable situation. Yes, there was local war as a result, but then these barbarians brought stability. In fact, it is argued that Theoderic, before the accession of Justin in 518, was setting himself up as an emperor. Everything he does in Rome and Ravenna is basically the same as what an emperor would do. Whether he would ever claim the title is, perhaps, immaterial. What matters is that he ruled like an emperor. Or to take the notorious Vandals. Once they were done torturing and executing a large proportion of the catholic clergy of North Africa, they decided to settle down, enjoy their new villas, and write poetry. In fact, the Vandal kingdom of North Africa, although weak when destroyed by Belisarius in the 530s, was relatively stable. So was the Visigothic kingdom of Spain by 589. For Gaul and Italy, before the Byzantine-Gothic wars of Justinian, the ‘countless local wars’ were, from what I can tell, largely confined to the border areas, to places like Septimania on the modern France-Spain border. The rulers of these new polities established themselves and fought their enemies, but it was not all war all the time. That said, they did behave badly a lot of the time, especially if a civil war erupted amongst the Franks. Gregory of Tours (d. 595) was particularly appalled by the behaviour of Frankish Christian soldiers and their treatment of monks, nuns, and church property. This paragraph is a zinger. He is using the image of the barbarian to describe modern liberals: ‘we … are living under barbarism, though we do not recognize it.’ (17) In fact, if one accepts Dreher’s view of things today, I’d much rather be ruled by Late Roman barbarian kings, thank you very much. For example, they were not actually all that into wanton destruction. 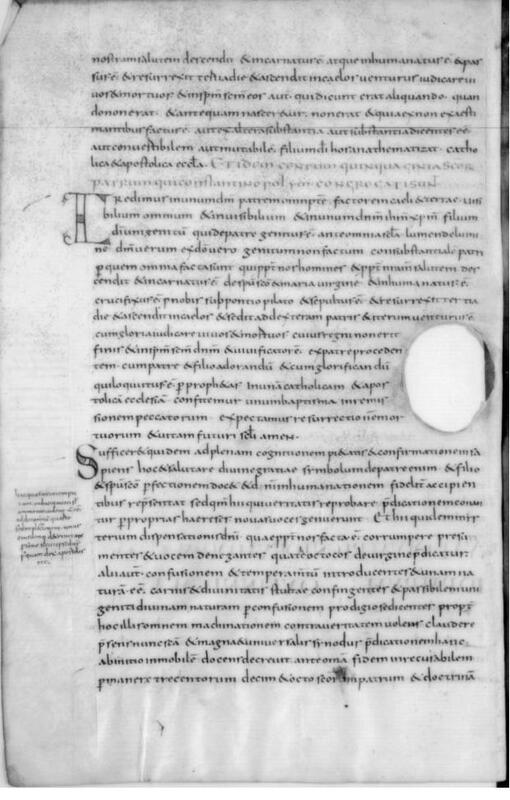 The text Anonymus Valesianus II includes a long description of things at Rome that Theoderic maintained. We have a mosaic of him from Ravenna, pictured at the right. Not only that, but his son held the consulship. His court helped foster the arts and culture of Cassiodorus and Boethius (the latter of whom he killed on suspicion of treason — perfectly Roman of him). When the Franks emerge as military force, they imagine themselves holding various ranks within the now deceased Roman bureaucratic infrastructure. They, too, build things. Or, if not they themselves, then the Gallo-Romans under their rule. As far as pillaging goes, this is, sadly, not a feature solely of barbarians. Soldiers have a long history of looting and destruction, whether they are Romans, Greeks, or barbarians in antiquity, or the medieval English in the Hundred Years’ War, or (sadly) even Allies in WWII. Soldiers are human; I do not wish to imply either that looting is not a big deal, nor that soldiers = barbarians. Just giving context. My final thoughts on what was meant to be a single post but is now three are as follows. The fall of the western Roman Empire, which was a protracted process over decades, led to a power vacuum in some places and some chaos in others. It resulted in the breakdown of much long-distance trade and the reduction of classical urbanism. In Britain, in fact, Romano-British culture was completely subsumed by the newcoming Anglo-Saxon powers. Materially, many people suffered and were very, very poor. Of these very poor, those who could sometimes joined monasteries. There were, however, legal restrictions on the movement of those we might call ‘peasants’, so many of the very poor did not join monasteries because of being legally bound to the land that they farmed. Nonetheless, for these people and for some of the ‘middle’ class and aristocrats, monasteries became places of refuge in the relative uncertainty of the new regimes. Sure. That said, everything in Italy, where Benedict lived, happens a few decades later than elsewhere (setting aside the possible exception of northern Italy, where first Attila in 450-2 then Theoderic vs Odoacer in the 490s, as well as some civil wars, made life difficult). Benedict is part of an international moment of monasticism that helps preserve writing as the classical culture of villa-based aristocratic living dissolves and is replaced by a largely illiterate military aristocracy who prefer hunting to poetry. Things are often very bad in the post-Roman world, and the new rulers and their armies often do terrible deeds. But they are not always so bad as people like Dreher make it sound, and all of them were committed to preserving Roman law, Roman taxation, long-distance trade, and Roman buildings as much as was within their power, with greater or lesser success. Here is one success, again of Theoderic’s. 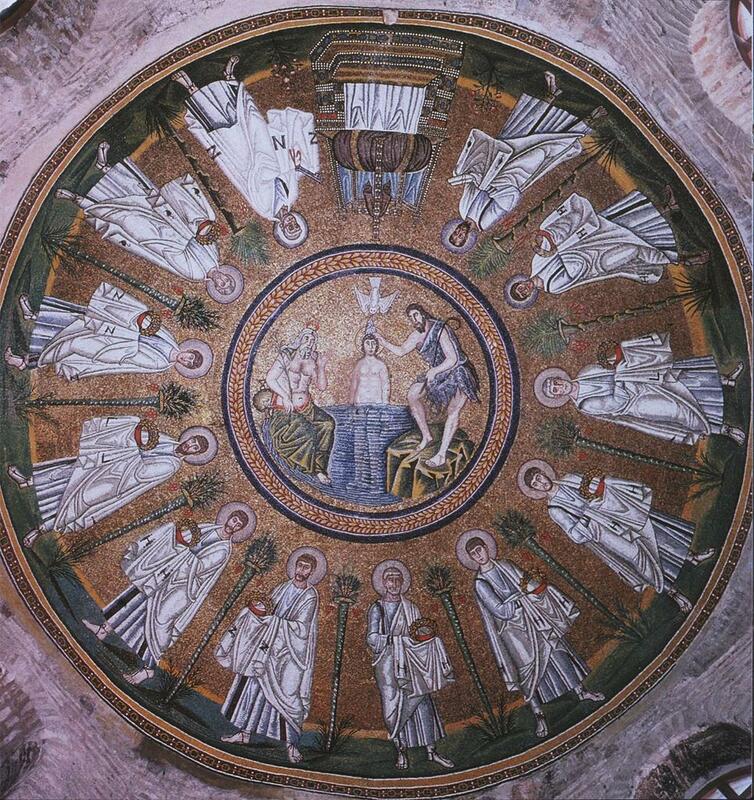 The Arian baptistery at Ravenna. I was going crazy hunting through a pdf of this manuscript today, looking for a few of Leo the Great’s letters (found them on 134v-137r). The manuscript is a copy of a Latin translation of the Acts of the Council of Chalcedon (451) made by a fellow named Rusticus in the mid-500s. Rusticus was the nephew of Pope Vigilius (pope, 537-555), so you’d think he’d have things pretty easy in the world of geo-ecclesiology. 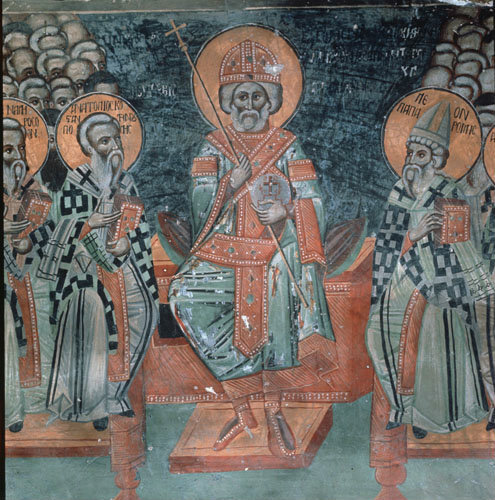 However, at the time Rusticus put together his Latin version of the Chalcedonian Acts, he was hiding out in a monastery in Constantinople with some monks called the Sleepless Ones (‘Acoemetae’/’Akoimetai’) — as one does. Rusticus was hiding out for the same reason he put together this collection of Chalcedonian documents. He was opposed to the Emperor Justinian’s activities against the so-called ‘Three Chapters’. As I have written before (with more context on the issue), opposition of the Three Chapters need not mean abrogation of the Chalcedonian doctrinal settlement. Be that as it may, people like Rusticus* felt that anything that sounded as thought it undid any of the things that Chalcedon did (whether doctrinal or canonical) undid the whole council. And the Council of Chalcedon, because of its espousing of the western Christology of Pope Leo the Great (pope, 440-461), was seen as essential to the western church — especially essential to East-West unity. Putting together his own translation of the Acts of the Council of Chalcedon and gathering together some of the relevant documents, then, was not just Rusticus’ way of killing time with the Sleepless Monks. It had a polemical purpose — to provide accurate ammunition to the western cause of support for the Three Chapters. In the end, Rusticus’ cause lost. Despite the fact that ‘Origenism’ (whatever that is) gets most of the airtime these days, the ‘Fifth Ecumenical Council’ of 553 was not about Origenism but about Christology. Obviously, the question of universalism is more of a hot topic today than the natures of Christ, but back then, this is what mattered to church unity and concord. 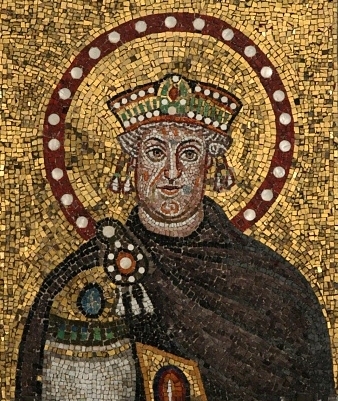 As part of his attempts to restore unity in the eastern church whilst maintaining it with the western church, Justinian guided the Council of Constantinople of 553 to what he hoped was a compromise position, and the Three Chapters were condemned. Ultimately this plan failed, but there we have it. Thinking on Rusticus, Chalcedon, and the Three Chapters/Council of 553 reminded me that ecclesiastical history is not, was not, set in stone. Sometimes we read the history of the church, and especially the ‘Seven Ecumenical Councils’ teleologically. We assume that of course the bishops gathered at Ecumenical Council X would approve Doctrinal Position Y. We act as though the doctrinal statements of the councils are the only logically inevitable results of a reasoned reading of Scripture. First, even if I accept that the seven councils termed ‘ecumenical’ are, in fact, true, even if I believe that they are the most biblically faithful and philosophically coherent options out there (I do), this doesn’t mean that, from the perspective of history and of the people living through them, these settlements were foregone conclusions. Take Nicaea, for instance. Nicene orthodoxy had a long, uphill battle for its establishment as the official doctrine of the church within the Roman Empire, and of the Germanic Christians outside imperial control, the only ones who really converted before being totally assimilated by their neighbours were the Visigoths in the 580s. If we set aside convictions that the truth will always prevail, it is certainly not a foregone conclusion that Nicene Christianity would survive and thrive as it has. Second, part of what makes orthodoxy ‘so perilous’ and ‘so exciting’ (quoting Chesterton) is the fighting. I have a friend who says that one reason she became Anglican is that, ‘God is in the fighting.’ Not just the fighting, of course — much of that is petty, ungodly, un-Jesus-y. But the uncertainty of it all — fighting for or against the Three Chapters. Believing that Chalcedon is the one hope for orthodoxy. Gathering together all the evidence you can find, just as Rusticus and Facundus did in the sixth century. God is with us in the struggle to learn and defend the Truth. We do not know for certain what the exact shape of orthodoxy’s road will be. Often, it is ratified after the fact. Indeed, it wasn’t until Chalcedon in 451 that the ‘Second’ Ecumenical Council of 381 was really and truly upheld as a universal council — and what makes it so different from the unratified, non-ecumenical Council of Sardica of 344? Outside of strong papal disapproval of Second Ephesus (448) (Leo calls it a ‘den of robbers’, latrocinium), is it so different from the First Council of Ephesus (now the ‘Third’ Ecumenical Council) in 431? We are the heirs of these councils — by faith in the Holy Spirit, we can believe that what the council fathers approved was orthodoxy. But to the people who lived through it — nothing was written. Not yet. Who knows what the future will mean for our days? *And a significant swathe of western/Latin ecclesiastics, including the whole diocese of Aquileia and a certain Facundus of Hermiana who wrote a book In Defense of the Three Chapters and Victor of Tonnena, who wrote a chronicle. And loads more.